Today, I’m dreaming of a Clawfoot Tub. It would be uber glorious to have one of these beauties living in the bathroom of my dream home. I can imagine myself soaking up the bubbles after a long day of mommy and work duties, especially in the upcoming cooler months. And in my dreams, it would look something like this…welcoming, elegant, and simplistic. If there were one item that you can have in your home, what would it be? Please share! 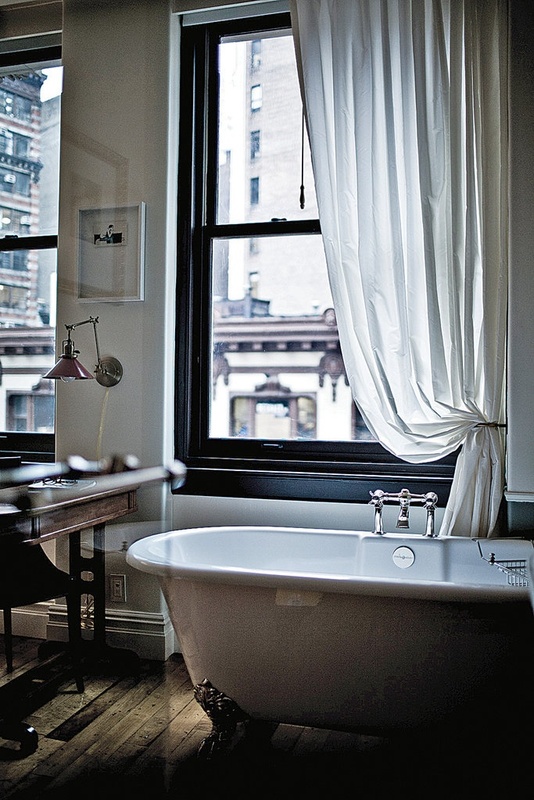 I would love one of those Victorian copper bathtubs- they look so magestic! It’s not what I want. It’s what I DON’T WANT. I want the big screen tv OUT of the library of my 1853 house. It’s my husband’s doing. A rooftop deck would be nice, so I can gaze at the stars! I’m with you on the tub 🙂 I want one, I’d like to re-do my bathroom to look more like the period my house was build in, maybe white subway tile on the walls too. I really just want an old farm house, one that hasn’t been “updated” with anything. Just a simple old farm house. Hi! I’ve nominated you for a Versatile Blogger Award. You can read about it here: http://brisvegasvego.wordpress.com/2013/08/26/versatile-blogger-award/ Check it out if you’re interested. Thank you for providing interesting blogging! And to be honest, even though they are beautiful, I’d hate sweeping under a claw foot bath. I’m so overly practical! Hi! I’ve nominated you for the versatile blogger award. Come and check it out if you’re interested. I’m with tkmorin, a whole room with built-in shelving for a library would be on my list. A library with a fireplace? Now that would be ultra-dreamy…someday! Found my clawfoot tub, complete with faucet/showerhead attachment on craigslist for a song. It sat in the middle of my kitchen for 5 months (ah, the surprises that pop up during a DIY bathroom remodel!) but was so worth it. Nothing like soaking in one of those old cast iron tubs, they hold the heat really nicely. Hope you get one. My grandmother had one and I loved it. She had a little faucet so it made lots of bubbles with bubble bath. I had always said that would be one of the few things I had to have. When I finally got a house I redid my bathroom after I moved in but could not really afford one. But I found one at http://www.vintagetub.com . They had a discounted / sale area. It was one that had gotten some scratches on the right side. So I got it discounted (quite a bit so I could afford it). That side faces the wall so I never see the scratches. I was so happy the day the truck pulled up and the guy unloaded the create (with a mini forklift) at my door and the guys working on the house carried it in. Luv it! I used to have one of those in the apartment I lived in back in the States. The building was about 100 years old by the time I moved away, to give an idea of how old the tub itself might be. Have you considered looking at recycling or refab centres? I knew a couple of places in Minnesota that would strip out buildings being demolished of things like doors and marble and such. I don’t know if they would collect the tubs, but I wouldn’t be surprised if they did. You might get an old one for a deal, if that is the case. I really really like the idea of this bath tub! It looks pretty relaxing! But I’d prefer a massive chaise longue to lie down with a steaming cup of tea and enjoy some good reading!!! So pretty. Love the contrast of the silver details. I grew up with a claw foot tub. So classic! Poor Jessie Ann | A personal style blog. I am not a soak in the tub person but definitely agree that a dream house is enhanced by a beautiful claw foot tub! A large kitchen with gleaming white units, a breakfast bar and plenty of space to entertain. If we ever do our extension it will hopefully become a reality soon. Well actually a Clawfoot Tub is what I would have too, but I think I would have to dedicate a lot of money towards an amazing desk for my drawing. love them too. I had one in the apartment we lived in when we first got married. I still miss that tub 30 years from then! You are so right about the tub, I just put one of those in my bathroom reno – all 265 pounds of it. They are beautiful! I always wanted a tub like this! One other feature that I would want for my soon-to-be apartment is a cafe-like kitchen! Someone to share a tub with!